NY Subway: What does it mean if a train stop is greyed out? The Cortlandt St stop was greyed out. I happened to wander near the station near the WTC Memorial, but it seems it was locked for some unknown reason. What does it mean if it's greyed out? The map's Legend doesn't seem to indicate what a gray stop represents. It means the station is closed. In this case, the station was closed after it was destroyed on September 11, 2001, and it has not yet been reopened. I believe it will be reopened sometime in the next few years as construction is completed on the site. Update: The station reopened on September 10, 2018.
edit: phoog beat me to the short answer, but offers less background. If you look up the 1 Train at the MTA website, you'll see that it does not stop at Cortlandt St as that station is temporarily closed. 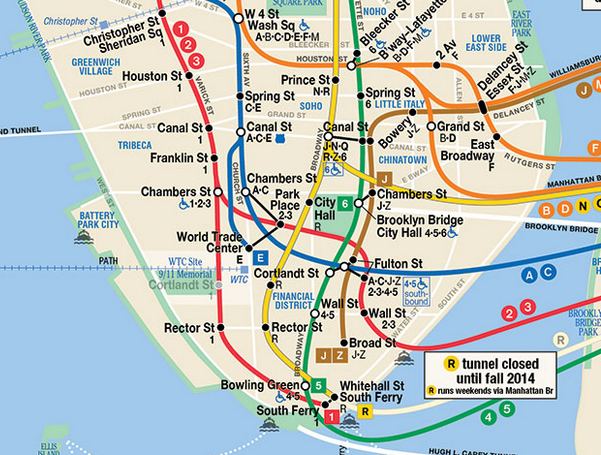 Most service was restored by October 2002, but the Cortlandt St stop remains closed, and so remains on the map as grayed out pending reconstruction of the World Trade Center area. The station finally re-opened as WTC Cortlandt St. in 2018, with 1 Train service, and is accessible via an underpass from the WTC Transportation Hub. Not the answer you're looking for? Browse other questions tagged trains new-york-city or ask your own question. Is there a difference between an Express MetroCard and a non-Express MetroCard?